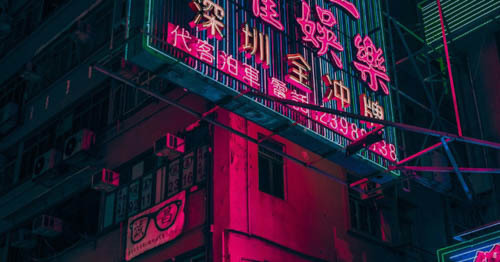 Foreigners in Taipei love to point out all the bad English they see—the 'Chinglish' as it's often referred to—especially on websites, ads, and brand packaging. Sure, it does exist, and could be a problem, but what's more interesting to me is just how much English there is in the first place. Forget about good vs. bad for a moment and take a look around. There's a LOT of English in Taipei. My rough guess-tamation would be that 60-70% of business signage and outdoor advertising in Taipei contains at least 40-50% English copy. That makes for a very bilingual population in a city that appears to be mostly Chinese speaking. The foreign population in Taiwan is minuscule compared to an international city like Shanghai. What's even MORE interesting is that perhaps up to 20% of all business signage and outdoor advertising in Taiwan is written in 100% English. That's right, not a single character of Chinese at all. That's mind-blowing. I would guess that only about 30% of signage and outdoor advertising in Taipei appears to be ONLY in Chinese. Here's an example: Two new shops have opened up across from the Beimen Gate; the big, red, Japanese-era gate near Taipei main station. One is a trendy new coffee shop called Mountain Kids. This coffee shop is loaded with Instagram snapping Taiwanese kids—likely in their early 20's. Mountain kids logo and outdoor signage contains no Chinese at all. It's all in English. In fact, their printed menu even Prioritizes English over Chinese. (Big English text, little Chinese text) The other shop Is an OK Mart right next to Mountain Kids. All English outdoor signage as well. I personally don't know what all this means, or what the take-away should be. I asked a few of my professional Taiwanese friends about it and they said it's simply a matter of creating better impressions. English looks cool, English looks international, so if they can do it, they will. Interesting. So, if you want to create a good impression in Taipei, you better stick with English? Let me know what you think about this, I'd love to hear some voices. As a thank you for doing that, I can offer you some free advice.